Liliane Bettancourt, the l'Oreal heiress whose daughter claims she's being used and abused by a shameless gigolo, is tuning the tables: she's suing her daughter for abuse. Bettencourt, France's richest woman, is not going quietly. 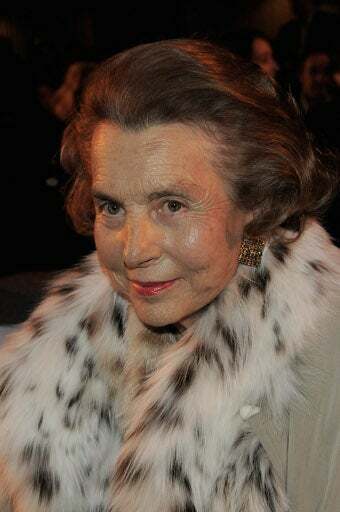 Daughter Francoise has claimed that her mother is unfit to handle her $20bn after Bettancourt gave photographer Francois-Marie Banier over a billion dollars' worth of gifts; she's also suing Banier for taking advantage of the aging woman. Now, Maman is suing right back: this time for "moral violence." In addition to their familial battles, the family's involved in an illegal political-donations scandal that implicates President Sarkozy. You'd think they'd want to minimize litigation where they can — but at this point, Francoise has tried three times to have her mother made a ward of court, and Bettancourt's lawyers claim the repeated attempts "amount to a psychological violence." Talk about fighting fire with fire.